The Crazy Bookworm: Why Steampunk, Why Now? I am pleased to welcome author, Adrienne Kress. She penned the sensational new novel The Friday Society that is getting great response all over the blogosphere! It’s interesting to observe Steampunk gaining . . . uh . . .steam. This time last year we had a Justin Bieber Steampunk music video, and Barney’s had a Steampunk Holiday window theme. And yet that wasn’t even the apex. This year we have more books than ever coming out in both the adult and YA markets. As well as several TV shows and movies, either wholly Steampunk or with delightful Steampunk flavouring. And the fashion industry has happily taken it onboard – heck Tyra Banks did a Steampunk photoshoot with her top model candidates this past cycle. Sometimes things just gain momentum and that’s all there is to it. But I do believe that, in the case of Steampunk, its current popularity reflects the current state of our society. The popularity of the oldy-timey Steampunk actually is a very modern thing. 1. We live in an age of magic. Most of us don’t actually understand how the tools we use work. I have this flat rectangular box that allows me to call people, take pictures, communicate by typing, play games and music, watch videos, etc., and so forth. It’s a magic box. How does it work? I have no idea. I really don’t. And most of us don’t. We live in a magical world, not quite understanding why things happen the way they do, but we are grateful for it nonetheless. Still, the not knowing can also be frustrating. Steampunk technology, on the other hand, is human-sized. Where modern technology in some cases needs magnifying glasses or even a microscope to interact with it, Steampunk tech consists of gears, levers, etc. Basically it’s a world of Rube Goldberg-y devices, one thing affecting another. We can see it happen. Further we can understand how it happens, which means we can make it ourselves. You can look at it and think . . . that makes sense. Things that make sense are enjoyable. 2. Making stuff has become a popular trend. I think this also stems from living in a magical world. Since everything is pre-packaged, pre-made, just press a button and the food is hot, people are starting to rebel slightly. Twenty-somethings, considered first adopters of any new technology, now are also getting into cooking, and knitting, and crafts. It’s like we’re going through another Arts and Crafts movement. This is what also draws people to Steampunk: making your own clothes, props, inventions. 3. Whatever you think of the Hipster dogma (the “it’s only cool if no one else knows about it” thing), you can’t deny its influence on fashion. Steampunk fashion has a great deal of crossover with it. Suspenders, button down shirts, hats and moustaches. It’s hard to know which came first, Steampunk or the Hipster (the Hipsters would say they did, of course), but each has contributed to the popularity of the other. 4. There is something of the slower pace of the past that people also enjoy in the present. It’s nothing new to say we live in a fast-paced world. If I don’t answer an email the day of, the sender worries something’s wrong. If I don’t answer a text almost instantly, I’m ignoring my friend. Obviously the Victorian/Edwardian period was much slower. Steampunk societies go for group outings that usually consist of walks. Steampunk creators take their time working on their projects. It’s a different tempo. 5. Manners. Whether or not we are less mannered now is a matter of opinion. Surely in some ways, definitely, but then again, I don’t think the lower classes from the Victorian period were necessarily all polite speech. Nor do I always see manners as being all positive. Sometimes the habit of tradition can get in the way of logic and progress. That being said, it’s nice to have a bit of formality. It’s nice for people to speak with some flare and a careful choice of words. It’s nice to be polite. 6. Cosplay. This is something specifically geeky, and not about society at large. Cosplay is a form of geekdom where fans will dress up as their favourite character, etc., at a convention. While you’ve always had people dressing up in Star Trek uniforms, cosplay has really exploded in the last decade – thanks in no small part to women attending conventions in higher numbers (not saying that men don’t enjoy it too, but you definitely see a correlation). It is fantastic to see the skill and effort put into making these costumes, and more and more people are getting into it. Steampunk has become a staple of conventions, and there are cosplayers who, having never considered doing Steampunk before, think, “Oh, that’s neat!” I know a group of people who first were introduced to Steampunk when someone suggested they do a Steampunk Xmen. 7. Tea. Everyone loves tea. And high tea, with little sandwiches and cakes . . . so good. 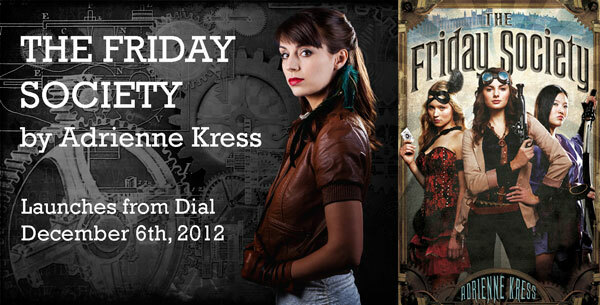 Adrienne Kress is a Toronto born actor and author who loves to play make-believe. She also loves hot chocolate. And cheese. Not necessarily together. She is the author of two children's novels: Alex and the Ironic Gentleman and Timothy and the Dragon's Gate (Scholastic) and is a theatre graduate of the Univeristy of Toronto and London Academy of Music and Dramatic Arts in the UK. Published around the world, Alex was featured in the New York Post as a "Post Potter Pick," as well as on the CBS early show. It won the Heart of Hawick Children's Book Award in the UK and was nominated for the Red Cedar. The sequel, Timothy, was nominated for the Audie, Red Cedar and Manitoba Young Readers Choice Awards, and was recently optioned for film. She's also contributed to two anthologies in 2011: Corsets & Clockwork (YA Steampunk Romance short story anthology, Running Press Kids), and The Girl Who Was On Fire (an essay anthology analysing the Hunger Games series - Smart Pop). The Crazy Bookworm sporting a new look! The Boys of Summer Cover Reveal!